May Allah's Blessings be upon our Leader of Spiritual Caravan of Eighteen Thousand Worlds, Muhammad Rasulullah and upon his noble heirs, every guide, the Shaykhs in the chain of transmission of baraka and 'ilm-e-ladunni, who drink from the Muhammadan Cup of pure Gnosis. The following is from the teachings of Noble Shaykh Muhammad al-Jamal ar-Rifai ash-Shadhili who is a resident and teacher of Masjid al-Aqsa (Dome of the Rock Mosque, the Noble Sanctuary) and guide in the Shadhili Sufi Path. He carry both the holy blood of the Prophet from his noble family line and also from the lineage of spiritual transmission that goes back to the Prophet himself. May Allah be pleased with him, sanctify his students and give him good life. The Shaykh has been living on the Mount of Olives in the Holy City of Jerusalem since the year 1959 and since 1994 he visits United States every year to see and to give freely to his thousands of spiritual children whom he calls 'beloveds'. The texts that follows are from his book of teachings, He Who Knows Himself Knows His Lord (man 'araf nafsahu 'araf rabbahu). The copy of the book is available from Sufi Gifts site. Know, my beloved, that internal vigilant watching (al-muraqaba) means that the slave has firm knowledge that the Lord is watching him in all of his states. His sojourn continues to Allah until he relinquishes his blameworthy qualities to remain in the praiseworthy qualities. He looks by the heart to Allah, Glorious is He, observing and visualizing the Real (al-Haqq) in everything, so that when the self is about to commit a disobedience, he finds the Real watching, feels ashamed, and turns back. If you observe Him while you are eating, you will find that He is the One Who brought the food to you without any power and strength from you, and He is also the One Who moves your hand to pick up the food you are eating. He is the One Who gave you the ability to raise the food to your mouth and He is also the One Who moves your mouth and make your saliva flow. He is also the One Who created in you the power to enjoy (food); then He is the One Who leads the food to your stomach, and gives your body energy and order. He is the One Who disciplines you. So learn that there is no actual Doer save Him. If this meaning becomes strong within you, it will clarify your actions and unify the Essence (adh-Dhat), and when the mastery of watching (al-muraqaba) increases you will see that He is the Eternal for His slave without action! This is the meaning of witnessing (mushahadah) everything, but this is a tasting matter (dhawq) and the mind can not grasp it, and none knows it, except the family of attentive care and purified ones. Know that unveiling (mukashafa) is the presence of the heart with Allah, Glorious is He and that witnessing (mushahadah) is the presence with the Witnessed. 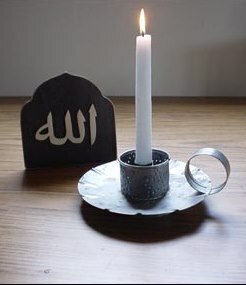 Witnessing is a consciousness in which the outer and the inner senses unite, that which demands this unity is a Light from the Mighty Witnessed that erases the darkness of the ego-self's veils and substitutes them so that the Real (al-Haqq) is seen by His own Light and all "otherness" annihilates by His manifestation. Nonetheless, witnessing is of many levels, such as witnessing the levels (themselves) and witnessing the intermediaries, which is the station of the intermediary between the seeker and the Ultimate End (al-muntaha). This is because to the seeker in the beginning of the matter, The Real reveals Himself in the epiphany of a live manifestation. But beyond that (level) there is the witnessing of the end ones (al-muntahiyyin), which is the highest station of witnessing. It is seeing the unity in the manifestation, so that the gnostic sees everything and is not veiled from seeing the Real (al-Haqq) by seeing the creation; and although he is fully consumed in Him, he is not veiled from seeing the creation by seeing the Real (al-Haqq), Possessor of Glory and Majesty. Witnessing the manifestation in the unity means witnessing the perfection of the holy essence of the One and the Only (al-Wahid al-Ahad). It is His manifestation to His Self with all the considerations of His Singularity and what it demands, and with all the characteristics included in the eyes of His Unity, such as, the Image of the Single Being manifesting eternally in the details of the levels of existence.